Published: Aug 5, 2009 to ? Once upon a time, the kingdom of Kouka was ruled by a red dragon in human form. By his side, four warriors imbued with dragon blood helped him lead the kingdom to prosperity. Time passed, and this tale became a legend to tell children. 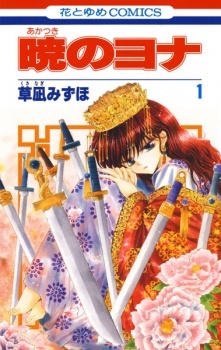 As the sole princess of Kouka, Yona lives a life of lavish ease. In love with her cousin, Su-won, and protected by her bodyguard, Son Hak, she wants for nothing and remains sheltered from the harrowing reality outside the castle walls. Contrary to this peaceful illusion, Kouka is about to undergo a political upheaval. After her beloved Su-won stages a bloody coup and murders her father, Yona is forced to flee with only Hak by her side. Though surrounded by enemies on all sides, the banished princess still yearns to save her kingdom. Her solution comes from an exiled priest, who tells her that her only hope is to find the four legendary dragon warriors. Guided by this seemingly fictitious myth, Yona sets out to find these warriors, determined to restore her kingdom. Akatsuki no Yona has been published in English as Yona of the Dawn by VIZ Media under the Shojo Beat imprint since August 2, 2016. It has been licensed in Spanish by Norma Editorial. - Overall, this manga is a 10/10 for me; if you are a person who is interested in the historical fantasy aspect in stories as well as romance, comedy, and action then this manga is practically calling out to you! Keep in mind though that this is a shoujo and a reverse harem, but don't let those two change your mind on possibly reading this. Every male in the reverse harem will make you like this series, and Yona herself, of course. Here is my review of Akatsuki No Yona by Kusanagi Mizuho. Brillant. Beautiful. Detailed. I loved it and the art's a big 'yes' for me. This mangaka can draw anything. Big palaces, beautiful cities and of course, interesting characters. I don't even need to say that the art needs improvement. It's gorgeous. All the characters have distinct personalities. They all have their own story and it's understandable to see why they are like themselves or why they are doing certain things. All the supporting and main characters are indeed, very interesting. There are some characters I wish to see more of and know a bit more about and I do wish the main character becomes a bit more independent (not like she isn't already), which is why I hesitate to give a full score. I personally find this manga enjoyable. I love love the ancient theme, the fantasy, the legend, the characters... Story does sometimes go off the main plot after chapter 60+, for some chapters which pulls 1 point off my enjoyment, which is why this section is a nine, but it's still brilliant and does make up and link up to the main plot. This series is amazing! If you're a fan of ancient-themed, romance, harem and fun characters, then this series is for you. It's gripping, suspenseful and enjoyable. I personally think this series is highly underrated and I do wish it was more popular for license in English. Not only is the story amazing, I love the way you see the characters develop during the manga. Also the side stories are so touching and they always keep me in their gasp to the very last words. The way the manga mixes history, mystics and comedy is truly making this a masterpiece. And than that touch of romance now and than LOVE IT. Akatsuki no Yona is one of my all time favorite mangas so far even though when I first picked it up my immediate thought was “this is sooo shoujo.” At first sight it basically looks like the typical manga full of lovey dovey scenes, bishounens and pretty and spoiled princesses who need constant protection from the bad guys, but I am SO pleased I was wrong. The idea is not that new to be honest, when I picked this up I had already read similar stories from Watase Yuu- sensei (Fuushigi Yuugi and Fuushigi Yuugi: Genbu Kaiden) where there was the same atmosphere feel: political intrigues involving royalty, the heroines must travel around the country looking for her destined warriors.. but I never get bored of these kind of stories because there’s so much going on: politics, war, friendship, love, loyalty, drama, adventure.. This story has all my favorite ingredients and is very well told so far, with a good pace that allows proper character development and interesting subplots. It has also very funny moments, so it’s all good. It’s brilliant, clean, and the mangaka seems to be able to draw just about anything and I’m really really picky when it comes to art. It’s not your usual heroine or your usual love triangle and that’s a breath of fresh air and it effectively grabs your attention. I’ve been following this manga for about 2 years now and I must say that it’s been one of the most enjoyable mangas for me to read. When I started to read it I simply couldn’t put it down until I read every single published page and I’m really glad that the anime is just as fun. Thanks for reading my review and I hope you enjoy this manga as much as I do!